For years, Zimbabwe has been exposed to extreme droughts like El Niño. This year, many areas are experiencing the heavy rains and floods as a consequence of La Nina. The SD=HS program is active in eight districts of Zimbabwe: Tsholotsho, Chiredzi, Goromonzi, Mudzi, Rushinga, Mt. Darwin, Matobo and Uzumba-Maramba-Pfungwe and supports farmers in developing adaptation strategies. Nearly 300 Farmer Field Schools (FFS) have been established in these districts. Experiences and results from a baseline survey have been used to improve tools like field guides for facilitators to use in the FFS curriculum. 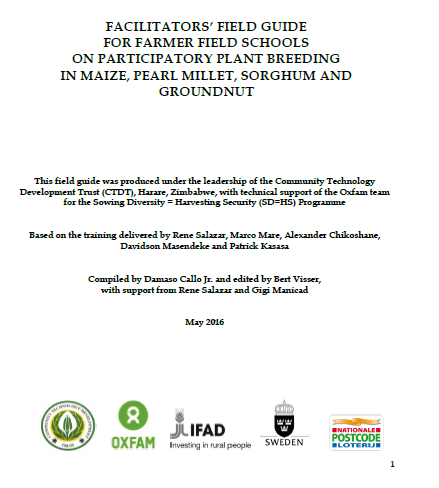 The ‘Facilitators’ Field Guide for Participatory Plant Breeding in Maize, Pearl Millet, Sorghum and Groundnut’, was developed jointly by FFS representatives, Oxfam Novib and the Community Technology Development Trust (CTDT) in Zimbabwe. 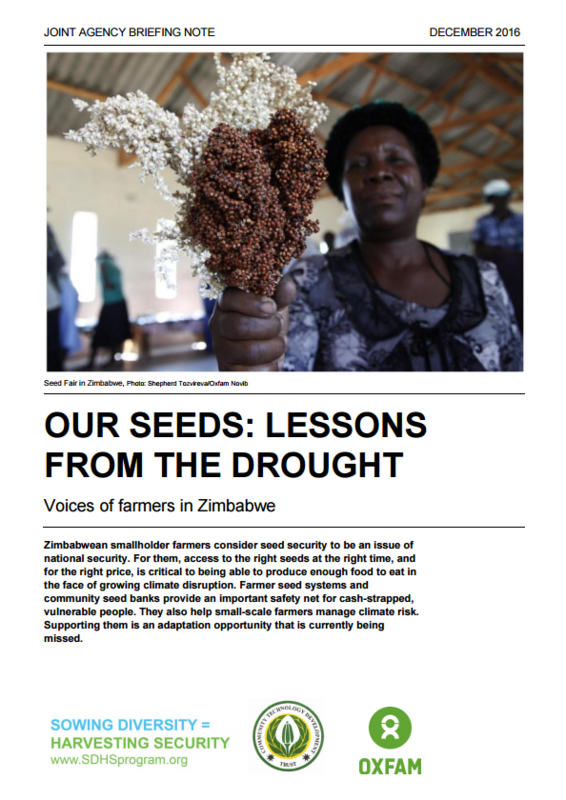 Seed and food fairs are effective in Zimbabwe because they allow farmers not only to display and exchange seeds and knowledge, but also openly share experiences and concerns about seed and farming systems. 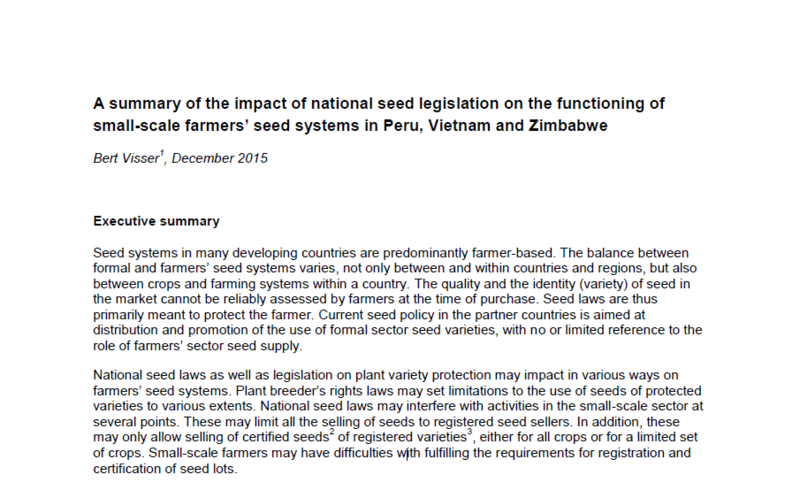 The fairs provide opportunities for collecting input directly from farmers on national legislation pertaining to the International Treaty on Plant Genetic Resources for Food and Agriculture. 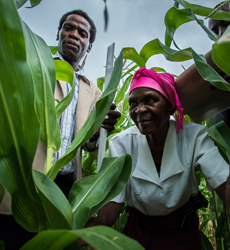 The first SD=HS Farmer Seed Enterprise pilot is currently being established in Zimbabwe. This started with an intensive consultation with key seed sector representatives at a multi-stakeholder meeting in March 2016. Their input determined the next steps, including crop recommendations and has guided the development of a business model and plan. This Farmer Seed Enterprise pilot will be a platform for testing practical aspects of current seed laws and how they affect farmers’ rights to produce and sell seeds in local markets. Share a Seed (ENG) from Oxfam Novib on Vimeo. 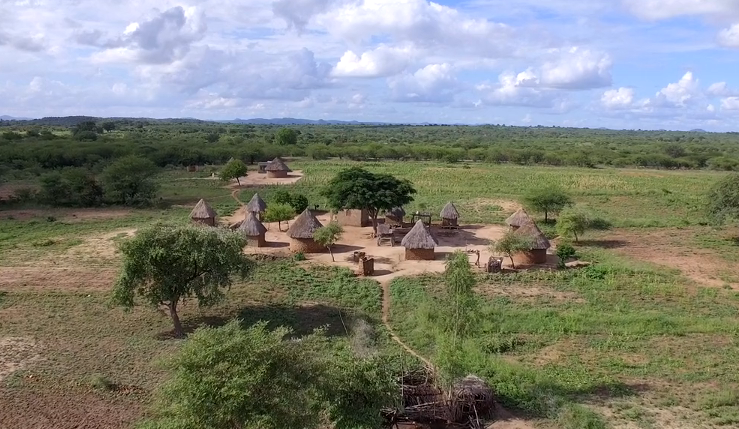 Based on footage of Dutch photographer Sasha de Boer, Oxfam Novib and CTDT together with the Dutch Postcode Lottery (NPL) created a video showing the Farmer Field Schools in Zimbabwe. The video is part of the 'Share a Seed' campaign (for more info: www.shareaseed.nl).